TRITON Restaurant in the basement of the Adria Hotel Prague on Wenceslas Square was built in 1912 as an art gastronomic club, where famous Czech artists like Voskovec, Werich and Vlasta Burian had their perfomances. 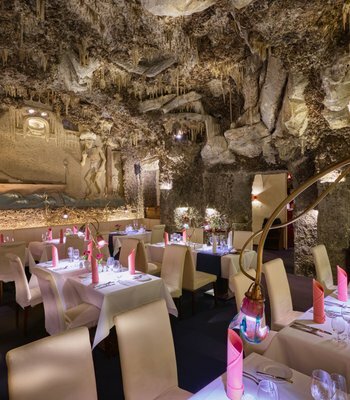 The restaurant in the stalactite cave harmoniously combines the unique atmosphere given by unique interior with more than a century of history and modern high gastronomy. 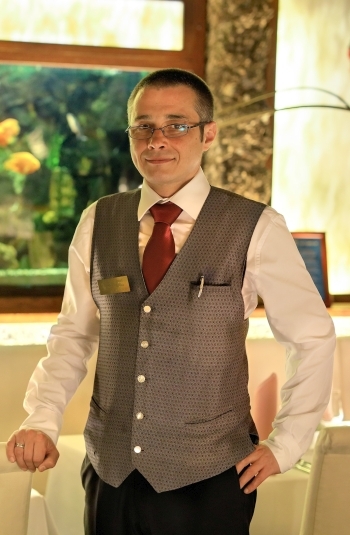 An inseparable part of the whole TRITON Restaurant team is a chef de cuisine Tomas Horak, restaurant manager Josef Liska and sommelier Karel Sadke. 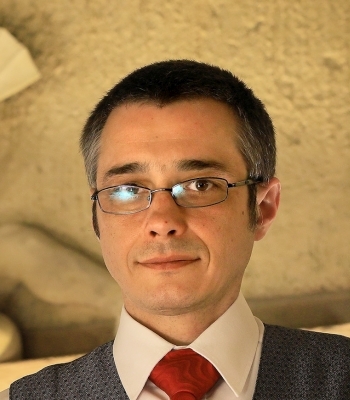 Tomas Horak worked in world-class Michelin restaurants, for example in five-star hotels in Germany, Austria, France and Luxembourg. He attended internships in Michelin restaurants Ikarus Hangar7 in Salzburg with two stars and La vie in Osnabrück with three stars, also in the Paul Bocus Culinary Institute in France. Tomas Horak is also a great painter. His favourite style is OptArt (Optical Art painting style). 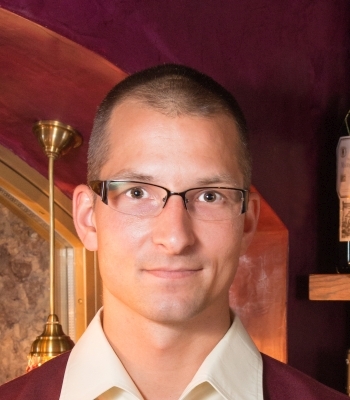 Top sommelier Karel Sadke chooses the best wines from around the world for our guests and also makes it his business to discover the true gems of small Czech wineries. 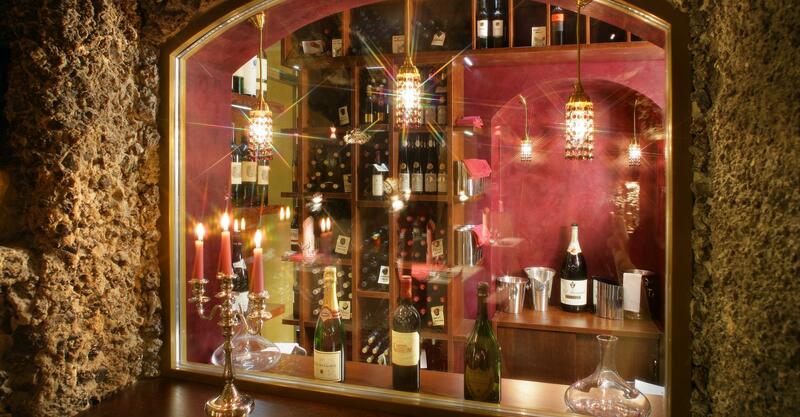 Why don’t you draw inspiration from our wine cellar and we will recommend the best wine to go with your dish. Treat your palate to the select wines from the Salabka Winery, created exclusively for our guests. 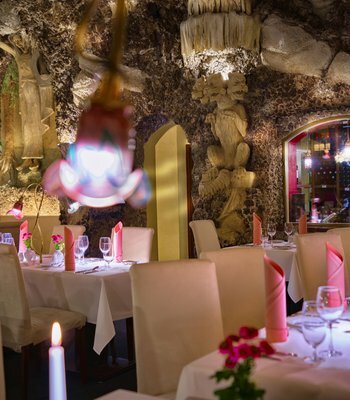 The history of the burgher's house on Wenceslas Square in Prague, where the Triton restaurant is currently located, dates from the late 14th century. • 1911 • In 1911 the building “U modré botky“ was bought by the hotelier Emil Rocak, who refurbished the building to turn it into a hotel and restaurant. 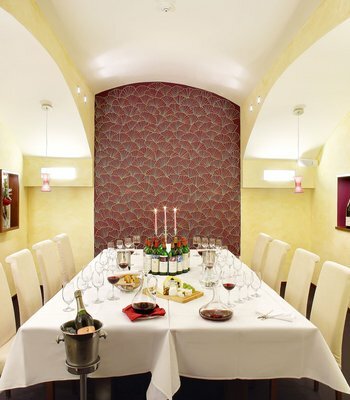 The restaurant was built in the cellars during the renovations. It included a mezzanine gallery with a stage for cabaret and other entertainment performances. 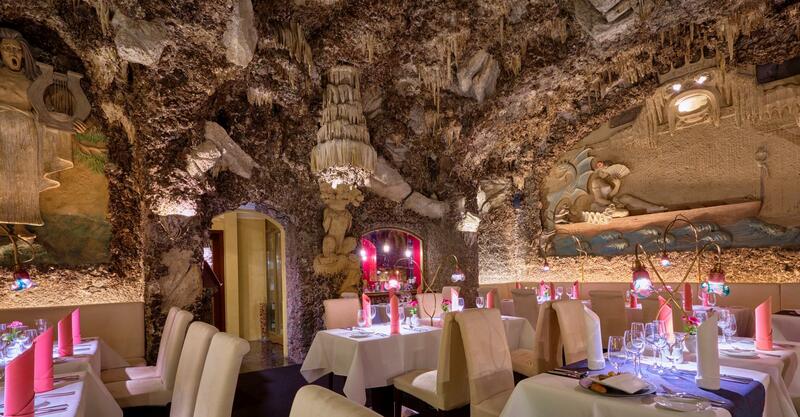 The hotel as a whole, with the stalactite cave received its occupancy permit in 1912. • 1918 • In December 1918, the house was bought by Mestska sporitelna, who, on 24-10-1919, sold it to Frantisek Tichy, who, among other things, was a hotelier and the owner of the building no. 784, as well as a founder of Czech cinematography, and, from 1918, its chairman. • 1920 • On 3 September 1920, in the stalactite cave basement hall, already part of Hotel Adria, the theatre/cabaret Revolucni scena started performing – Together with the theatre's operator, Emil Artur Longen (an artist from Hasek's a Gellner's anarchist circle) the theatre also held performances by Fernec Futurista, Vlasta Burian, Rudolf Jílovský, Karel Noll, Eman Fiala and others. • 1925 • The best era of the spaces of the restaurant Triton was at the beginning of 1925, when Vlasta Burian presented his own theatre “Divadlo Vlasty Buriana“ - at the time, the most successful theatre in the inter-war period. From the very beginning, it was a meeting place for important personalities of the Czech political and cultural lives, such as Jaroslav Marvan, Jindrich Plachta, E. E. Kisch, Sasa Rasilov, Hugo Haas, and more... Burian's theatre opened every evening with a short performance by Vlasta Burian and Emil Artur Longen. Longen here worked as an actor, but he also tried to lead Burian towards a satirical comedy character. However, Burian at the time leant more towards a solo type of comedy with no regards for scripts that demolished not only literary basis but also dramatic interplay with unexpected scenes. 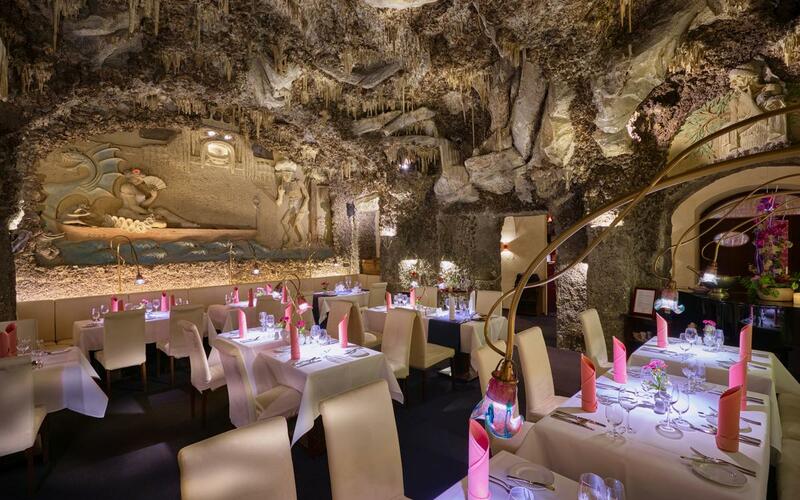 Vlasta Burian performed in the stalactite cave of the current restaurant Triton until 1928, when the theatre moved to another location. Due to its increasing popularity, Burian's theatre moved from Wenceslas Square 26 to Svandovo divadlo in Smichov. • 1927 • A hall called Burianovo divadlo was built during renovations in 1927. The hall, including its façade, was renovated and used like cinema Hollywood until 1930. In 1940, the National Heritage Office issued a statement declaring the house on no. 784 as heritage protected. In 1951 the building was placed under state administration and the lobby was modified to house the facilities of the Mechanika cooperative. In 1974, the cellars of the front building were renovated for the Adria College Club. • 2012 • TRITON restaurant celebrated its 100th anniversary and published the book “S Trojzubcem u 100lu”. • 2018 • The current history of TRITON Restaurant is written in the sign of culinary progress. 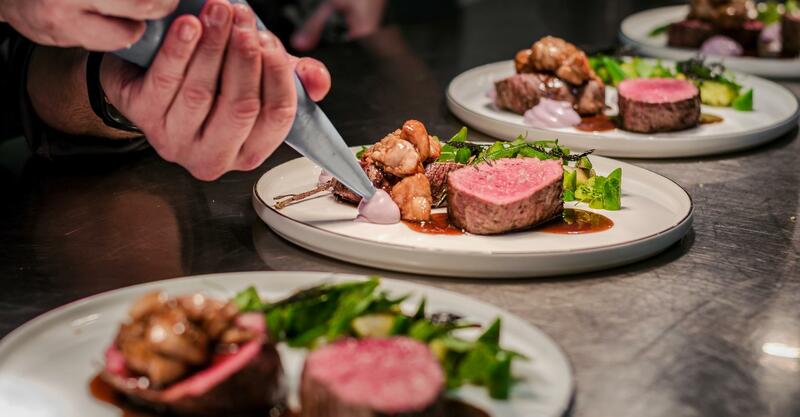 Modern Art gastronomy by chef Tomas Horak and more than a century long tradition of the spirit of hidden treasure on Wenceslas Square brings together an incredible experience that you will never forget. 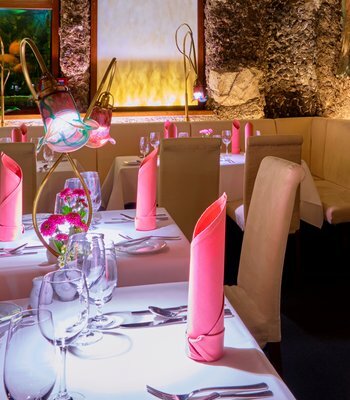 The interiors of the Restaurant TRITON are influenced by important art trends at the turn of the 19 and 20th centuries. Symbolism, which follows romanticism, using of symbols or signs that try to uncover the secret inside things. 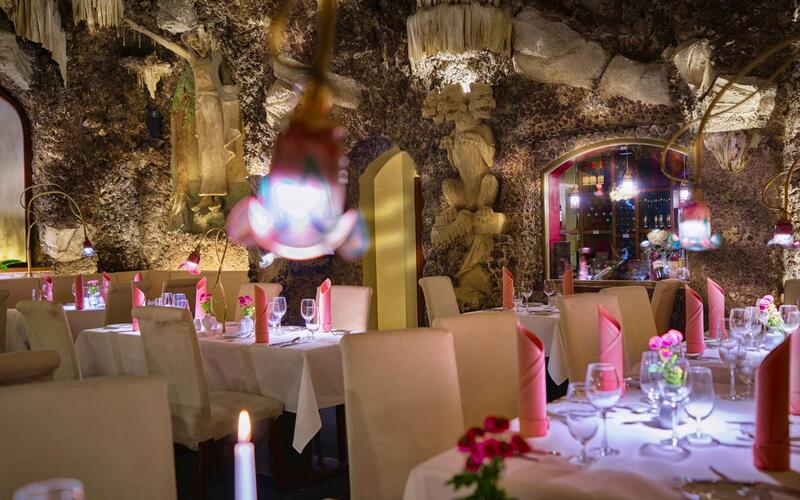 The interiors of the Restaurant Triton offer you sights of not only Greek, but also Roman and Egyptian mythologies. Every detail has its hidden meaning, including the orientation of the cardinal points. The symbols on the eastern side, the entrance to the restaurant, represent the dawn—the beginning, positive qualities and inner purity. In contrast, on the western side you will find night symbols, negative qualities and conclusion. The central theme is the ancient tragedy of Orpheus and his wife, Eurydice. 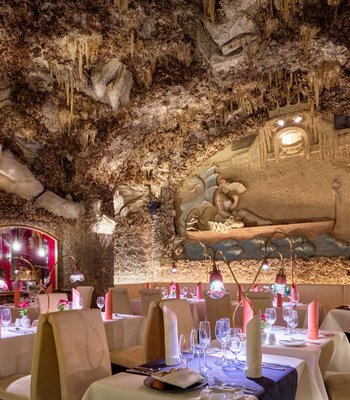 The decoration of the restaurant represents the underworld, Hades's realm of the dead. You can see not only Orpheus and his lyre, Eurydice. Pythia and Charon, but also Hades, here called according to the Roman mythology, Pluto. The central theme is the ancient tragedy of Orpheus and his wife, Eurydice. 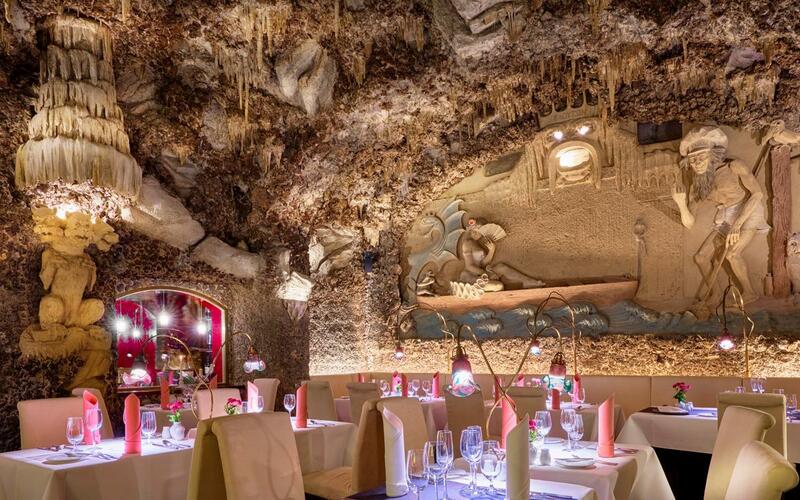 The decoration of the restaurant represents the underworld, Hades's realm of the dead. You can see not only Orpheus and his lyre, Eurydice. Pythia and Charon, but also Hades, here called according to the Roman mythology, Pluto. 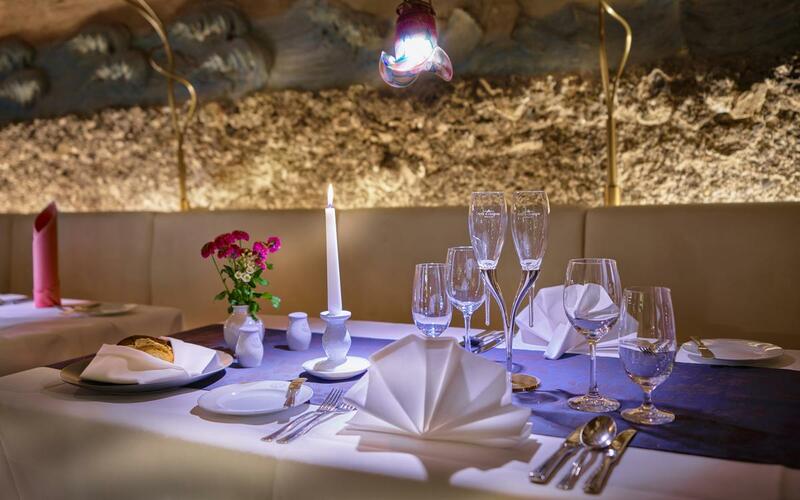 The restaurant is named after Triton, son Poseidon, god of the seas, and Amphitrite, goddess of the seas. He is half man, half fish. Like his father, Poseidon, he also carries a trident. His main symbol, however, was a shell, which he used to calm or ripple the waters. 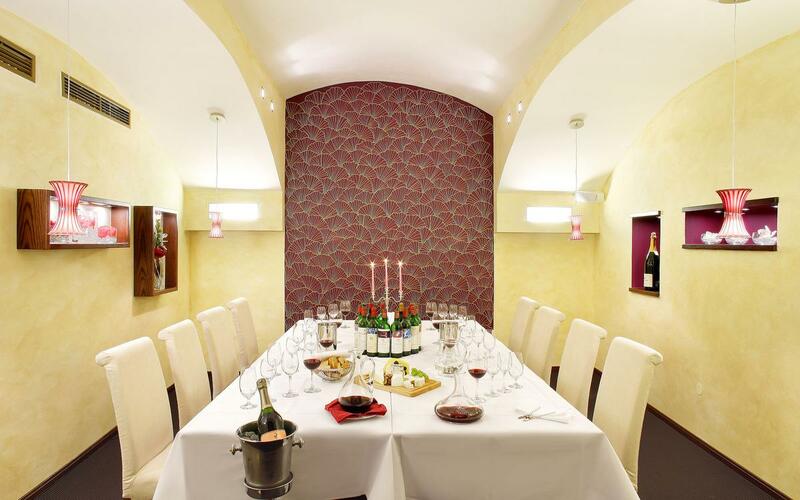 Are you planning a stylish corporate party in unrivaled premises right in the centre of Prague? 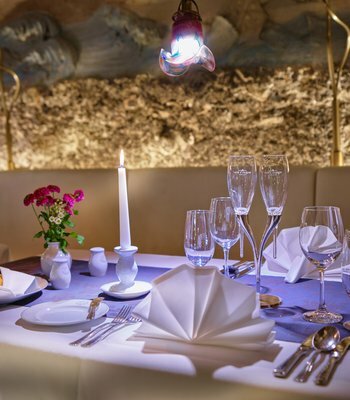 The unique atmosphere of the stalactite cave in the center of Prague, in Wenceslas square, fine dining, experienced service, professional organization. TRITON Restaurant is an ideal and novel place to hold private or business events for small or big groups. Whatever your desire, please share it with us. We will try our hardest to fulfil it. You can use the entire restaurant space or a private lounge. 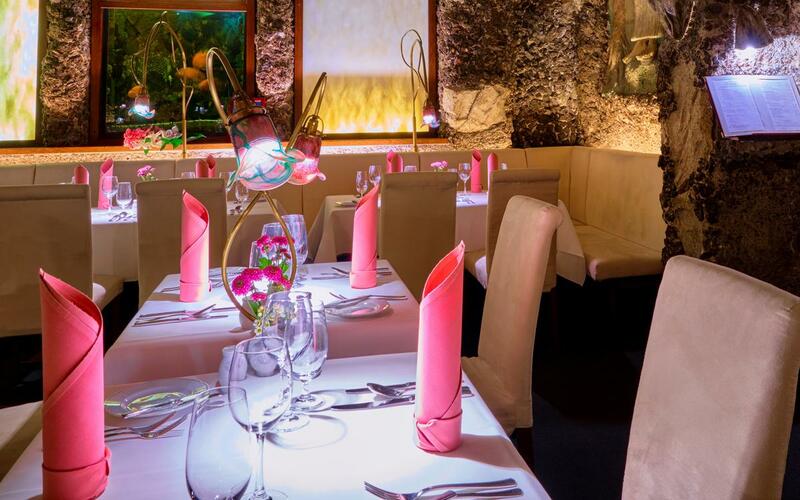 Choose our restaurant to hold an unforgettable corporate event. 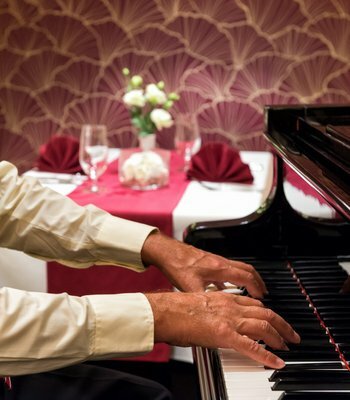 Savour our original atmosphere and great cuisine. We can organize a party for you in line with your wishes, taking care of everything from the planning to the actual implementation. We will arrange it all for you. 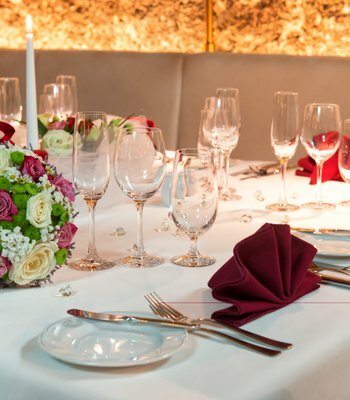 Celebrate your happy day in this unique setting in the heart of Prague. Triton Restaurant is the right place for a small or large wedding. 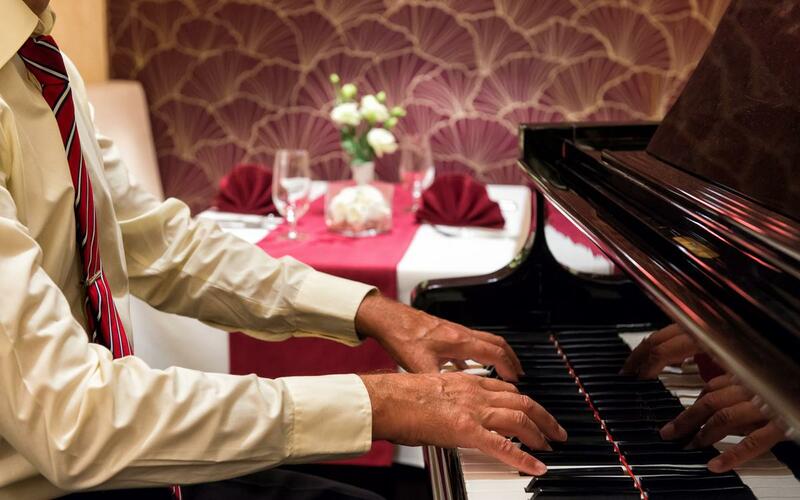 We have everything you need to treat yourself and your guests to an unforgettable experience of a lifetime. We can organize an unforgettable party to celebrate graduation, birthday, company anniversaries... put simply, any event that you wish to mark with great food in a unique atmosphere. 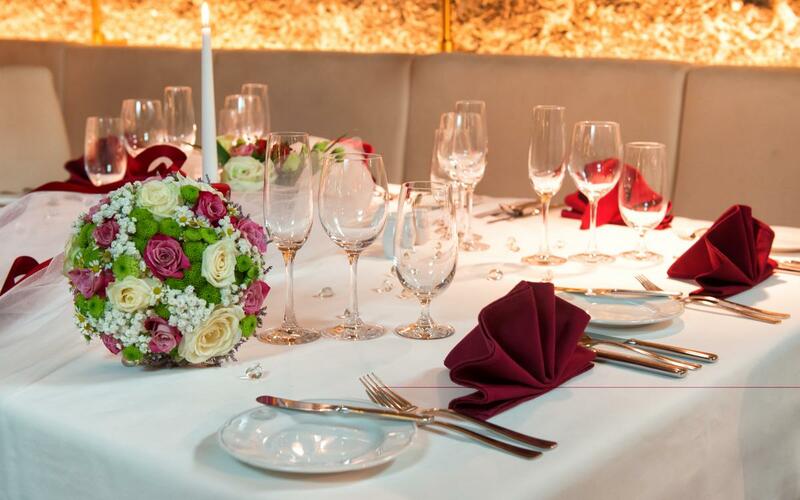 We can also prepare a special group menu, according to your wishes and needs, and take care of the course of your event. We can prepare a preliminary offer and suggest possibilities for the realization of your event.